Strong IGP has become largely irrelevant for the people it was aimed at. Now, you no longer need to use a weak GPU due to size constraints. Just stream a feed, which can be video and games, from a more powerful computer somewhere else in the house. The only thing the end computer needs is a video decoder. Heck, it doesn't even need to be an x86 based PC, semi modern ARM devices can also decode video streams no problem. Storng IGP is meant for mobile market, and it's more than relevant there. Except that nobody is pairing AMD CPUs with good screens. I don't think the issue with AMD IGP is being paired with a good screen, rather, it's the power consumption and heat output of those A series APUs. Yes, Intel HD4x00 and 5x00 graphics are inadequate at games at practically all resolutions, but they run videos and streams just fine at 1080p. AMD A10 graphics are inadequate at 1080p, and you'd even want a 960m or 970m for some decent graphics. And let's not forget that the market is heading towards higher energy efficiency and thinner/smaller form factors... AMD A series chips are just out of the question. 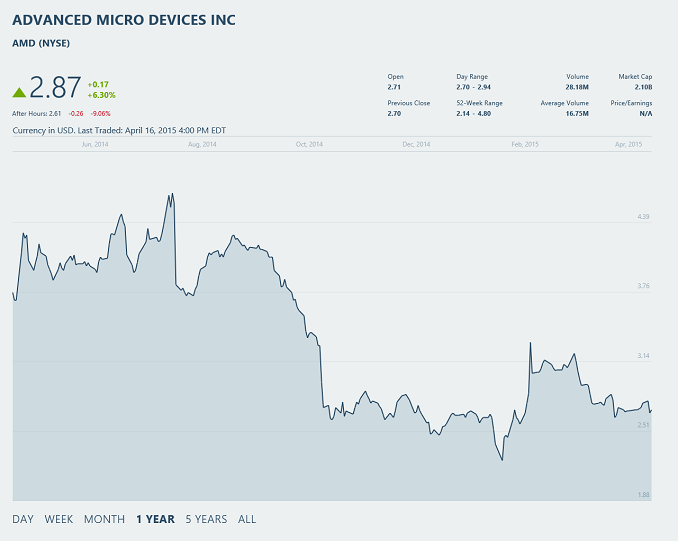 "Earnings Per Share -$0.09 $0.02 $0.05M"
I guess AMD really is tanking since the gigantic AMD red logo paying anandtech has been long gone for a while. The massive fanboy dollar pumping amd machine is dead. Do the amd fanboy infiltrators still get free hardware on the sly ? Who knows ?